I’ll take Redford over DiCaprio any day. This should come as no surprise, considering Donna Summer is my most-played station on Pandora, followed closely by Lou Reed. I’m the Kevin Kline of the Big Chill, boasting to Jeff Goldblum he hasn’t listened to anything new since Motown. I have a tendency to dig around in the past, to romanticize it. Lately I’ve been thinking a lot about a man I used to know almost 20 years ago. We “friended” one another on Facebook several years ago, but our connection is strictly past. We don’t have a present. He doesn’t seem much interested in building one either. Suddenly Motown doesn’t sound so sweet. Letting go of what is old. I find it challenging on the best of days, more so on those when my future feels uncertain. When I can’t see the train coming. Can’t see its lights or hear its horn. When I don’t know if it’s just a stop away, or miles back. On those days I want to retreat, to return to where I’ve been, to what I’ve known, because I can’t see what’s ahead. Perhaps it isn’t my job to worry about where the train is and when it will arrive. Perhaps my job is to trust, or at least try to trust, that there is in fact a train, and it is indeed on the tracks. And then consider and delight in the possibilities of where I might go when it arrives. Like I did my first time in overseas. Settling into the train seat next to my traveling companion, Robert. It was early, still dark outside. I pulled a card out of the seat pocket – a map of the train’s trajectory. “We could go to Zagreb!” I announced, excitedly. I’m not sure I knew where Zagreb was. Up until that moment I certainly had no desire to go there. But suddenly it was a possibility. One I hadn’t thought of before. And that changed everything. 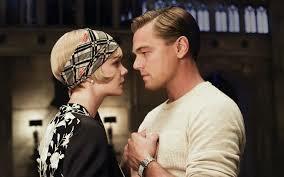 I suppose going to see the newest The Great Gatsby – Artist’s Date 22 – was a small way of opening myself to the new. Pondering the possibility that what comes after might be even better than what was before. Open to Leonardo DiCaprio brushing the hair off his brown – Gatsby’s signature gesture – instead of Robert Redford. Open to Carry Mulligan crying over the beauty of shirts rather than Mia Farrow. Even if I am admittedly attached to my idea of their predecessors. Redford, the quintessential leading man of the 1970s. Butch Cassidy and the Sundance Kid. The Way We Were. All The President’s Men. Farrow, the iconoclast who popularized the pixie cut and changed the rules for how married couples might choose to live – the image of her waving across Central Park to then-husband Woody Allen locked in my mind. A little bit before my time. Something I just missed. Elusive. Juicy. Attractive because I wasn’t quite there. Wasn’t in it. What came before. What was. I think of Nick telling Gatsby one can’t live in the past, and Gatsby’s insistence that he can – the manufacturing of his own misery. 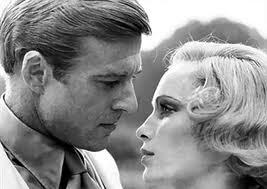 And Gatsby insisting Daisy say she never loved Tom. Somehow it wasn’t enough that she loved Gatsby once, loves him now. He is driven by his own revisionist history. It is the flip side to my own – my insistence that if love ended before I was done, or if it didn’t look the way I imagined or hoped for, it never was. Like the time I burned a letter from my religious studies professor in my kitchen sink. After seeing me in San Francisco, seven or eight years out of college, he wrote to me, “…the swan had emerged…” I had grown into a beautiful woman. I was delighted by his reflection. But our friendship changed over the years. He became less available, and then, for a time, not at all. I set fire to his words, convinced what he said had never been true. I got an email from him about a month ago. In it he thanked me for my continued correspondence over the years. He told me I am the only student among the thousands who studied with him that he has any kind of a relationship with. I wrote him back, thanking him, telling him that that bit of information was a game changer. A potent reminder that I have no idea how others perceive me or our relationship. It is perhaps the most revolutionary new idea of all. It leaves room for love. For possibilities. That something could be better than Motown.